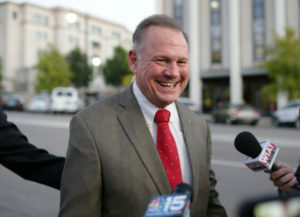 BIRMINGHAM, Ala. — With President Donald Trump standing on the sidelines, Republican Senate candidate Roy Moore and his allies on the ground in Alabama are bracing for an extended conflict — not with Democrats, but with their own party in Washington. The state GOP has the power to revoke Moore’s GOP nomination and ask election officials to ignore ballots cast for him, but that would risk a lawsuit and backlash from Moore supporters. Miller reported from Washington. AP reporters Kimberly Chandler in Montgomery, Alabama, Jay Reeves in Birmingham, Alabama and Alan Fram, Catherine Lucey, Andrew Taylor and Matthew Daly in Washington contributed to this report.